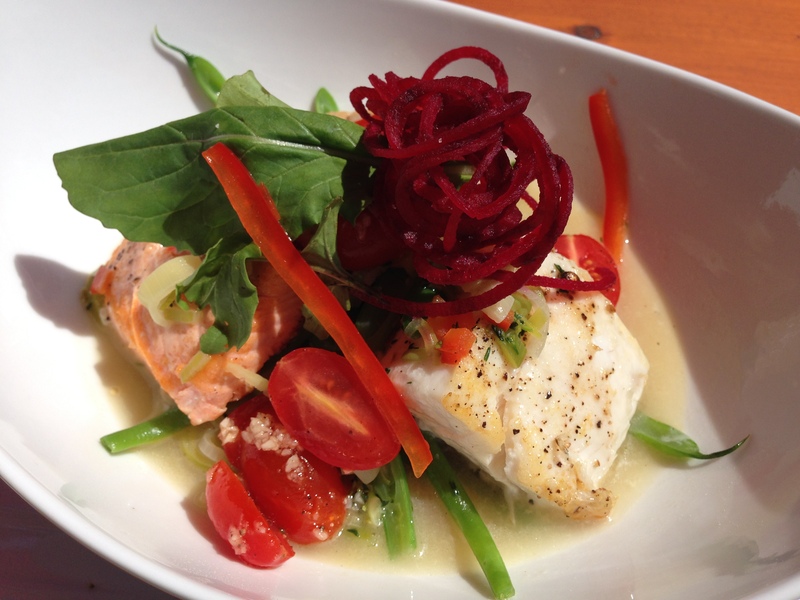 Tofino is a culinary destination! This town’s boat-to-table food culture thrives here with talented chefs, farmers, fishermen, harvesters, and purveyors. 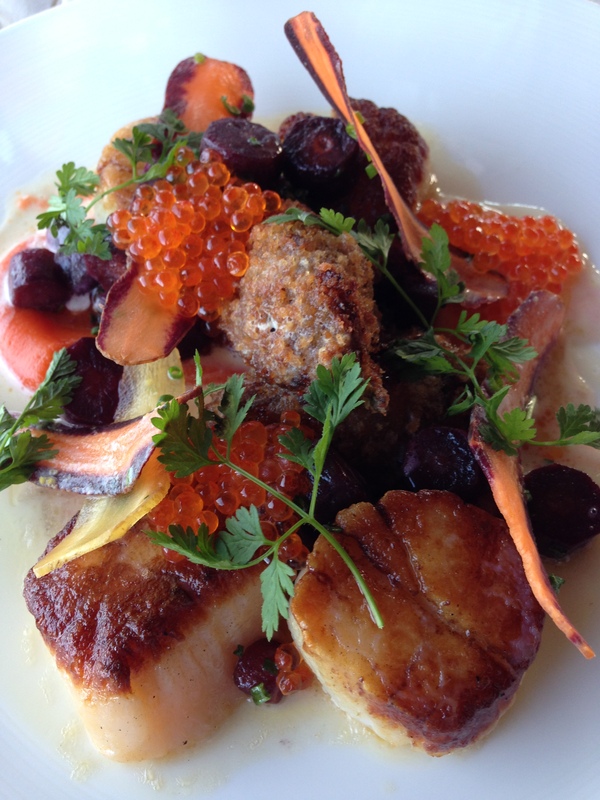 Chef’s creations are inspired by the season’s bounty, and local abundant supply of fresh produce and fish. In fact, every May, there’s a Feast Tofino, a month-long celebration of coastal food featuring resident and regional chefs, special events and exquisite menu features. We met visiting Chef Trevor Bird from Fable during the Themed Week for Shellfish. #feasttofino www.feasttofino.com See our list of dining recommendations below. 1. The Pointe Restaurant: Known as one of Vancouver Island’s top dining destinations, The Pointe delights diners with refined West Coast cuisine. 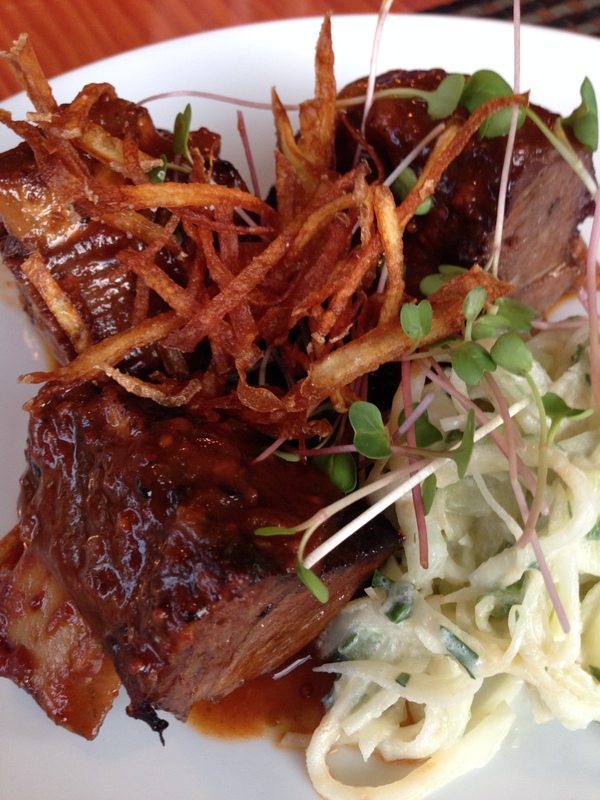 The restaurant opens up to 260 degree views of the Pacific Ocean and rugged coastline. Executive Chef Warren Barr and Restaurant Chef David Sider source farm-fresh, organic Vancouver Island ingredients, and fresh seafood from nearby waters to create elegant dishes. 2. Red Can Gourmet: Chef Tim May sources food as local as possible for simple elegant comfort food. He prepares inspired Pacific dishes, including artisan pizza, fresh seafood, mac & cheese with pulled pork, gourmet take-out, and caters for weddings, parties, reunions of 300+ people. One of our favorite dishes was the Red Can Signature Seafood Chowder with fresh seafood, onions, celery, cumin and thyme. 3. 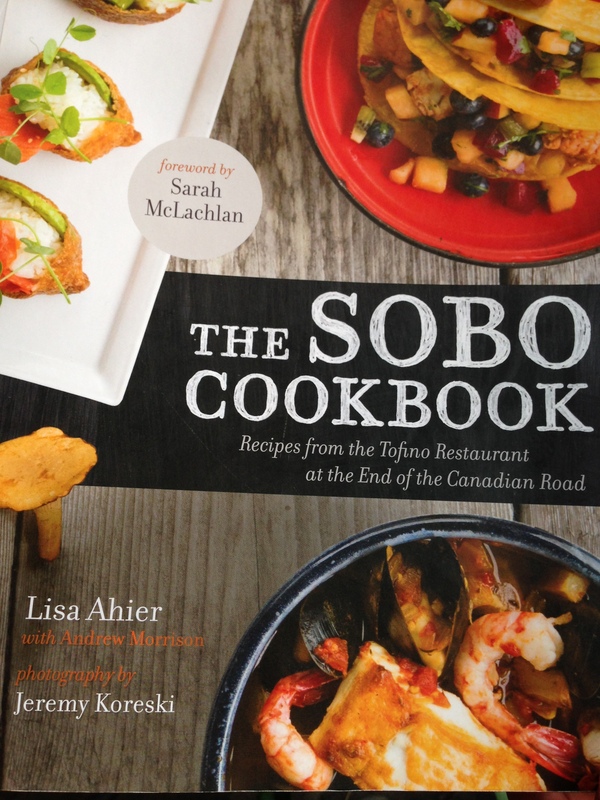 SoBo: stands for the Sophisticated Bohemian, and for Lisa Ahier, co-founder and chef of SoBo. Lisa is a Texan transplant who invents bold, imaginative dishes made from simple, fresh local ingredients. She is 100% SoBo! Lisa shares, “The whims of nature guide SoBo’s menu and dishes are created based on “what our friends like”. Love oozes from her food and everyone can taste it! Her husband Artie is her #1 support and both of them have planted their roots into Tofino. You’ll often see Chef Lisa, Artie and their children Barkley and Ella, at SoBo, located in the heart of Tofino at 311 Neill Street. 4. 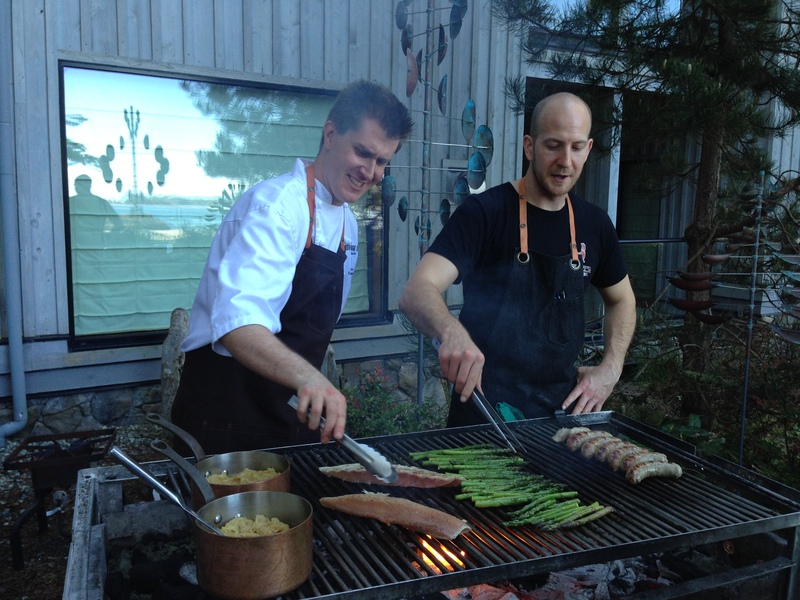 Wildside Grill: “Natural foods from natural dudes” Commercial fisherman Jeff Mikus and Chef Jesse Blake are the culinary force behind the Wildside Grill. Chef Jesse Blake shared his story of how he moved to Tofino, met his wife, then met Jeff. They are an ideal team bringing the freshest seafood straight from the boat to the kitchen to your plate. 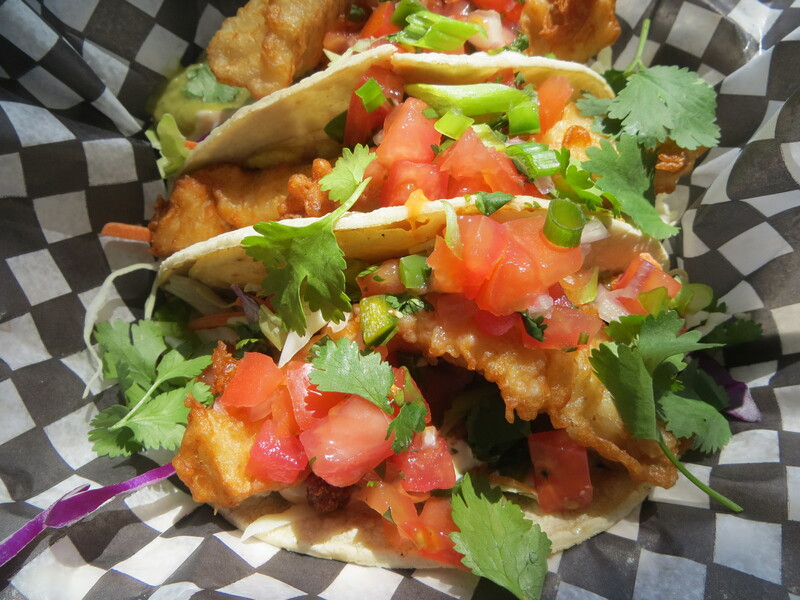 Chef Jesse spread out a sampling of panko crusted fish and chips, fish tacos, a pulled pork sandwich, and garlic chili spotted prawns – delighting all our of taste buds! 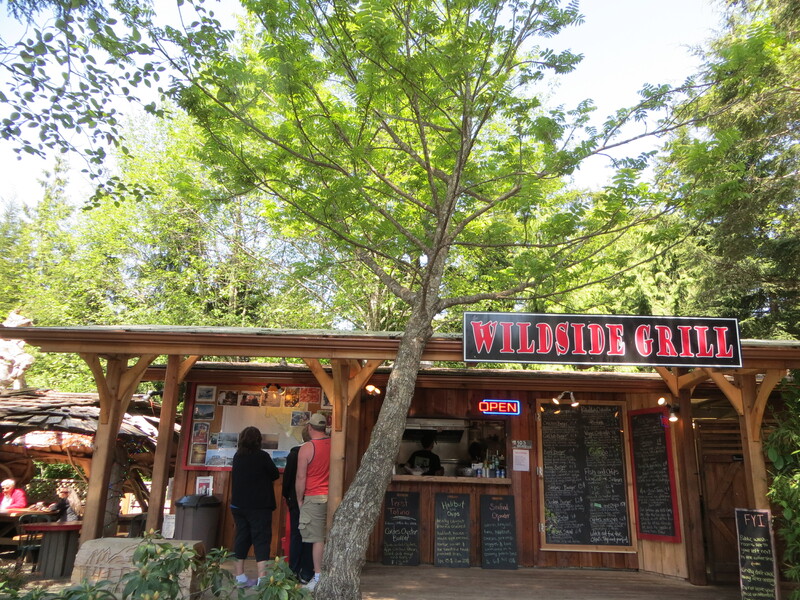 The Wildside Grill is located along the Pacific Rim Highway, behind the Tofician Coffee House, and next to Beaches Grocery Store. 5. 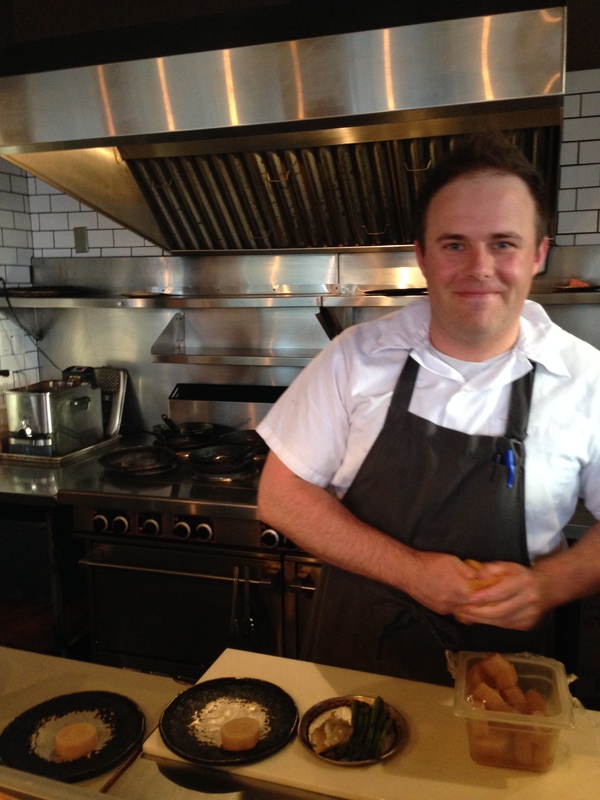 The Spotted Bear Bistro: Chef Cameron Young presents upscale classic comfort food. 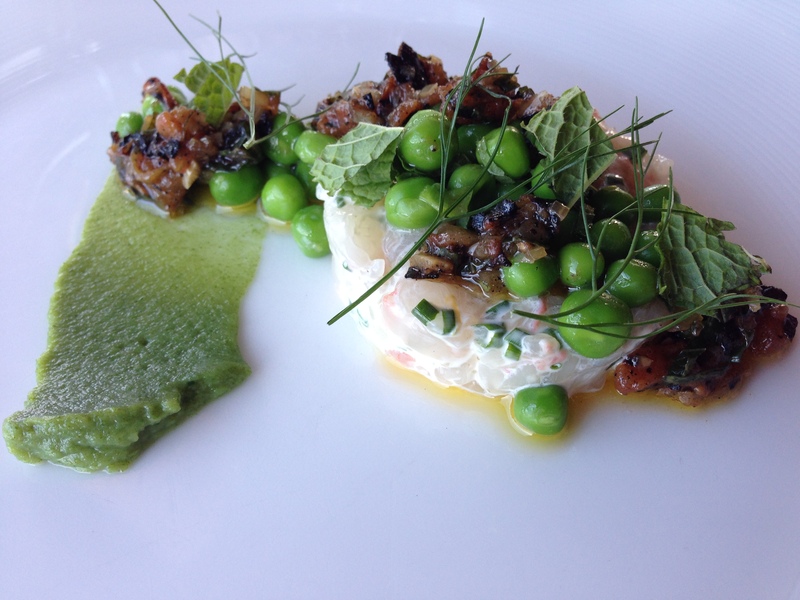 His dishes are inspired by the fresh top quality produce from local farmers on Vancouver Island. The menu is divine! Starters such as Salt Spring Island Mussels infused with chipotle, coconut, cilantro, lime, to entrees like the Pan Roasted Duck Breast with carrot, celeriac, parsnip, sweet potatoe, pear puree. 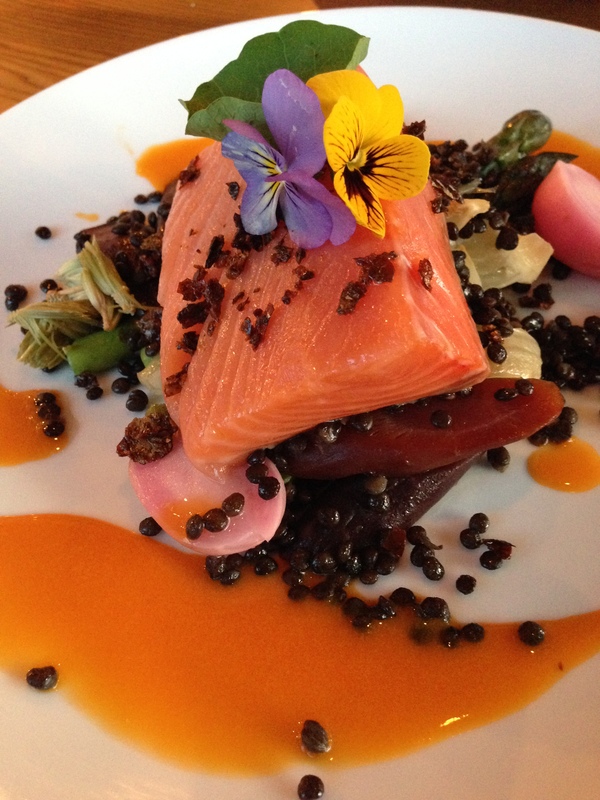 We had this fresh salmon buttressed with fennel, asparagus, carrots, radish. “Chef Cam”, as the staff calls him, sprinkles flavor with local micro greens, edible colorful flowers, and spruce tips on some dishes. His design eye turns each plate into an art masterpiece. Check out this video of Chef Cameron, the “Spotted Bear Master” and highlights of Tofino by Ethan Miller Productions – click here! 6. Best Coffee in Tofino: The Tofician! Just ask, everyone will point the way…it’s just next to Beaches Grocery Store on the Pacific Rim Highway. You’ll discover lots of “end of the road” culture here. 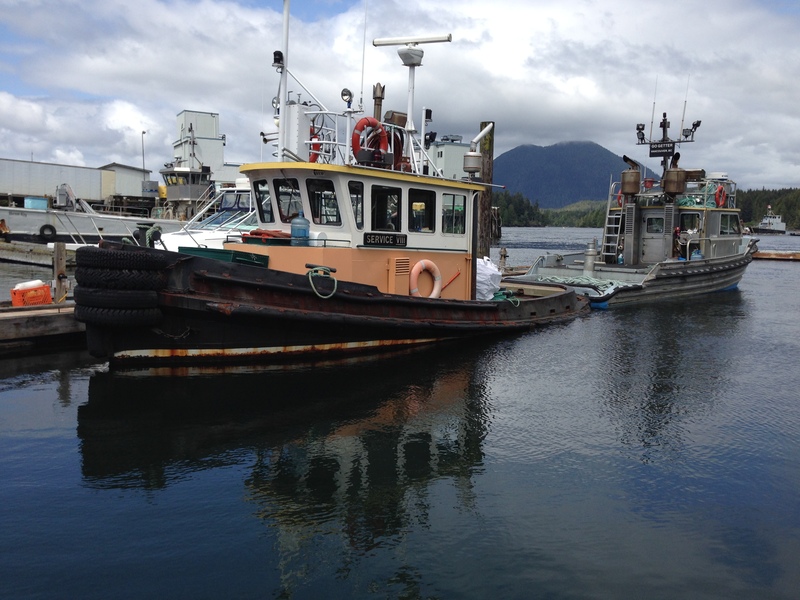 Click here to see our recommendations on where to stay, what to do, and how to get to Tofino. 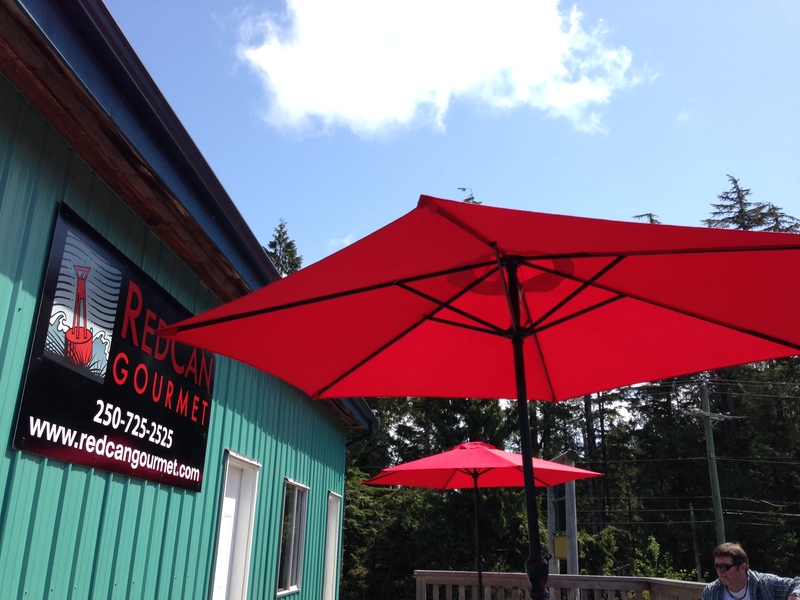 Acknowledgements: we’d like to thank The Pointe Restaurant at Wickaninnish Inn, SoBo, The Spotted Bear Bistro, Red Can Gourmet, Wildside Grill, for hosting our delicious meals during our stay! this all sounds delicious! You are making me hungry!